Maritime Art Week – Simon Patterson’s "The Undersea World and Other Stories"
Simon Patterson is a British artist that is probably best known for his work The Great Bear, a London Underground map in which the names of the stations have been replaced with those of philosophers, film stars, assorted celebrities, artists and even saints. In 1996, Patterson was shortlisted for the Tate Britain’s prestigious Turner Prize. Patterson takes inspiration from the famous French undersea explorer Jacques Cousteau who in the 1960’s and 1970’s hosted the very popular TV show The Undersea World of Jacques Cousteau. Hence the title of the exhibition. The Undersea World and Other Stories presents an anthology of Patterson’s works alongside a new commission Cousteau in the Underworld which takes as its first layer mid-19th-century Admiralty charts of the eastern Mediterranean and Aegean where the sea is necessarily represented through its limits: soundings show the depth to its bottom; rocky outcrops and sandbanks mark where its surface is interrupted; details of landmasses, such as coastlines and buildings seen from seaward, its edges. Into these empirical documents Patterson folds Greek mythology – a belief system in which the adventures of gods and goddesses were used to interpret existence and conduct. Not content with setting these two descriptive structures in mutual confrontation, Patterson further complicates the matter by drawing the figure of the French oceanaut Jacques-Yves Cousteau into his network. The pioneering scientist’s long-running television series The Undersea World of Jacques Cousteau, first screened in 1966, turned the TV set into a porthole through which world-wide audience could explore the deep, aided by the crew of his ship, Calypso. Naming is an act that concerns Patterson: Cousteau’s ship adopts that of a nymph from Greek mythology, which in translation means ‘I will conceal’, quite the opposite of Cousteau’s mission. Here are some of Patterson’s earlier works. a traditional nautical signal and a ship’s chandler provides necessary supplies. The numbers become less obscure through the realisation that they relate to the authors’ birth and death dates. 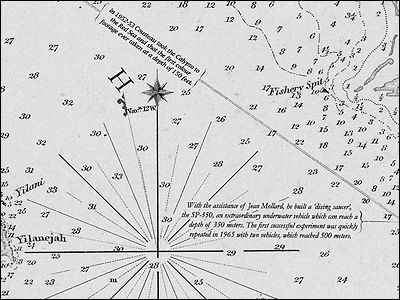 The information on the sails is presented as formal yacht identification markings ­ highlighting Patterson’s obsession with systems. The work evokes ideas of escape and travel, as the artist invites the viewer on a voyage into a fictional world created by the three writers. Simon Patterson is a smart conceptual artist interested in ideas and language, not pretty pictures. Lucky for us, his works have been heavily influenced by maritime history, heritage and culture. The Undersea World and Other Stories is on exhibit until October 26, 2008. General information about the National Maritime Museum, a must see for anyone interested in all things maritime. Posted on June 11, 2008 June 11, 2008 Author Peter A. MelloCategories maritime art, maritime heritage, Sea-Fever StyleLeave a comment on Maritime Art Week – Simon Patterson’s "The Undersea World and Other Stories"
The Wooster Collective is one of my favorite art blogs. Their interest is primarily street art and I’ve previously posted some of their incredible discoveries. 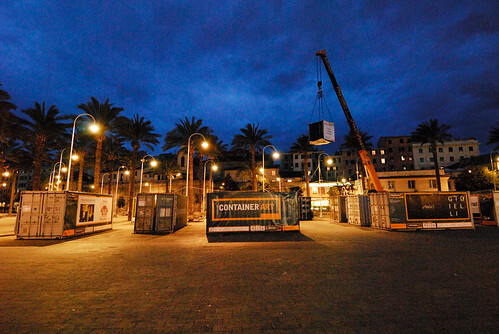 Last week they posted about The Container Art Project which is currently in Italy. Empty containers ambling around the world, filling with beauty wherever they stop. An urban, itinerant and adaptive art exhibit. 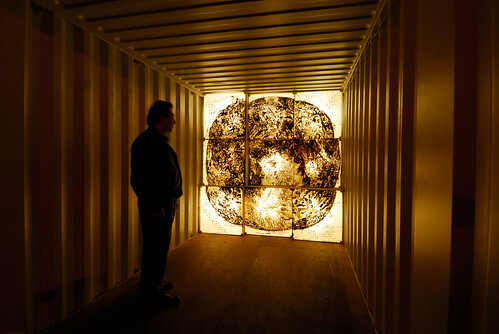 Installations, sculptures, and paintings of the most innovative talents of the local and global artscape in many containers spread around town. 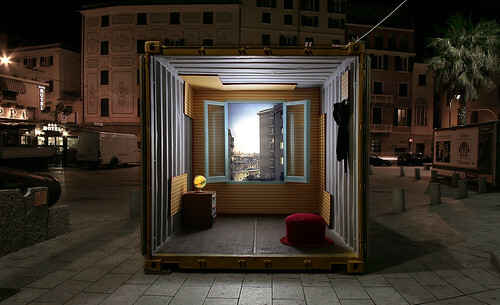 A different work of contemporary art in each container, a different mix of artists in each city. Interactive containers connecting communities far away through art. We amble around the world following our impulses and interests. 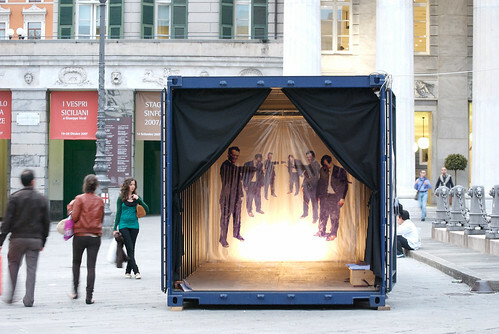 Below images from Container Art’s Flickr photostream. Maritime Art Week – David Byrne’s "Playing the Building"
Since there are some cool contemporary maritime influenced art projects currently on exhibit across the globe, we’ve declared this Maritime Art Week and we’ll take a peak at a few. One of my all time favorite bands was the Talking Heads and long after they broke up, I’ve followed the music, art and activities of front man David Byrne who’s latest project is an installation in the beautiful Beaux Arts Maritime Building in New York City. From David Byrne’s website where there’s also a good interview about the project. Creative Time presents the most innovative art in the public realm. From our base in New York, we work with artists who ignite the imagination and explore ideas that shape society. We initiate a dynamic conversation among artists, sites, and audiences, in projects that enliven public spaces with free and powerful expression. Here’s a video slide show of some of Creative Time’s past projects. It’s great to see that art can bring life to a beautiful old maritime building, one that harbors so many memories and stories about New York’s rich maritime heritage. Posted on June 9, 2008 June 10, 2008 Author Peter A. MelloCategories life, maritime heritage, Sea-Fever Style2 Comments on Maritime Art Week – David Byrne’s "Playing the Building"
I loved Joshua Allen Harris’ earlier creations so much that I posted off topic about them. Now he’s done a Sea Monster which is cool and definitely suitable for Sea-Fever. Enjoy! This is off topic from what is usually covered here but heck it is my personal blog and I love this street art by Joshua Allen Harris. Using discarded plastic bags, Harris makes animals and other mysterious creatures that jump to life on NYC subway grates. There is something really magical about this. Hope you enjoy it too! Sea-Fever Style has moved to Saturday to make way for Sunday VOWs. Above: VICTORINOX SWISS ARMY SAILING JACKET made with wind- and abrasion-resistant stretch fabric, a snap-off hood and an adjustable harness to help prevent unintentional swims. $650. swissarmy.com.